Good afternoon and welcome to day ten of my 12 Days of Holiday Cards and Crafts! Yeah, it’s Friday! Happy day! Today we are going to go buy our Christmas Tree when Leao gets home from work. Today’s card features the cutest digi from Mo’s Digital Pencil. It is called, ‘Not Even a Mouse’. I print and cut it using my Silhouette. I chose this pattern paper from Authentique again. The soft muted colors reminded me of a sweater. 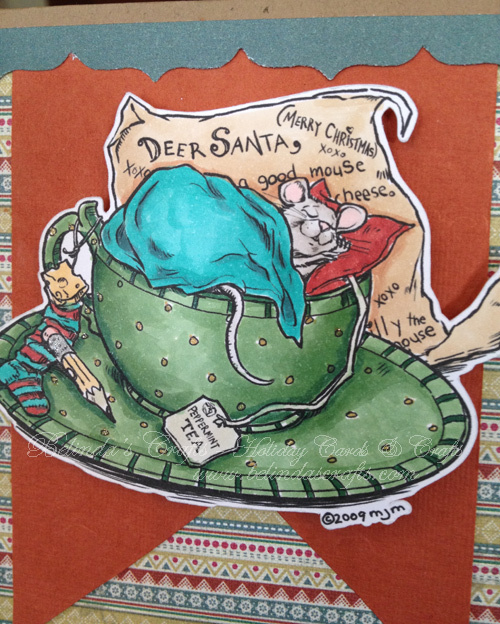 The little mouse looks so cozy . 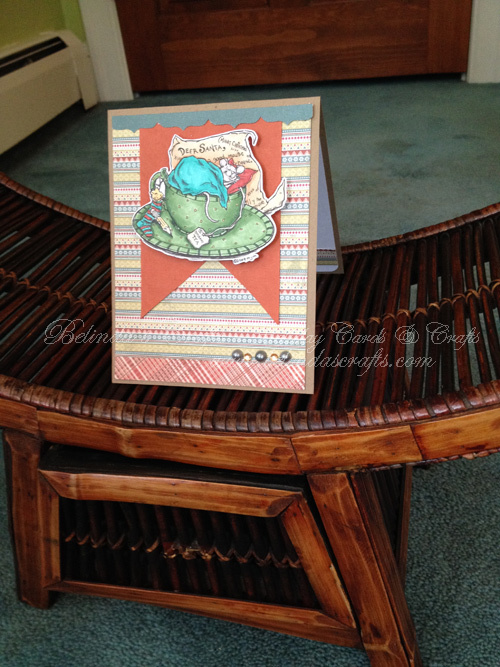 I used a Kraft paper as the card base with a top fold. I pulled the colors from the paper for my inspiration for coloring with my Copics. I love tea and tea cups so this image just had to be mine. I also used some collage paper on this card that I have had for years. 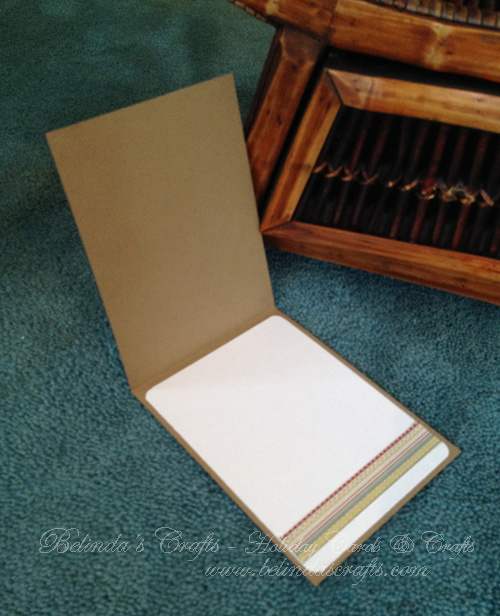 It’s a pad of 20 sheets with handmade papers in various colors and patterns. I found one that matched the color in the pattern paper and used it to mat the image. I added pop dots for dimension and bling on the bottom for balance. Inside I put a strip of the patterned paper for continuity. No greeting or sentiment on the inside. Just letting the image speak for itself. I used my foot stool in my craft room for my prop. I hope you have a blessed weekend! I will be back on Monday with Day 11. 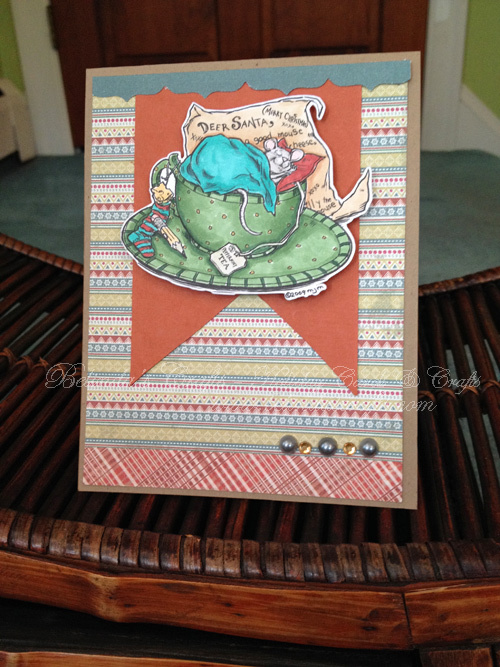 Another adorable card! You are so very talented! !